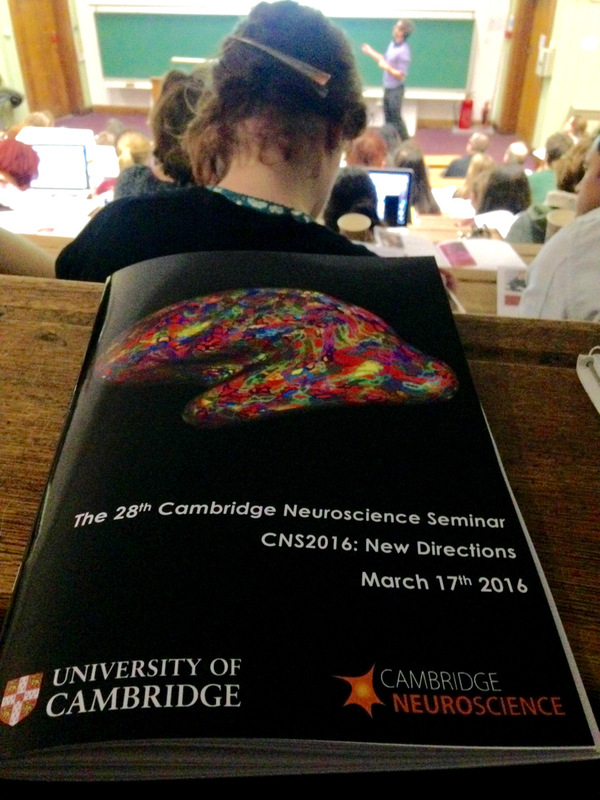 Once again, Cambridge Neuroscience put on a highly interactive and successful symposium to showcase cutting-edge research. This year’s theme was “New Directions” and the delegates (in excess of 300) truly gained insights into new, innovative studies. The meeting was opened by Professor Bill Harris, head of the host Department of Physiology, Development and Neuroscience. He thanked the seminar organisers, and especially Dr Dervila Glynn, for their hard work, and promised an exciting d ay of talks and posters. The programme committee for CNS2016 were Professors Bill Harris, Ole Paulsen, Angela Roberts, Jenny Morton and Dr Dervila Glynn. The first presenter was Dr Rick Livesey who explained how the human cerebral cortex develops differently from other primates and mammals to contain more cortical neurons. This higher number of neurons is thought to be one of the reasons for our higher cognitive abilities. Next, Dr Lucy Cheke presented a new way of measuring memory in humans. She and her colleagues have developed an innovative spatial working memory task which was used to assess memory in obese subjects. They found that a higher BMI was correlated with impairments in memory, offering new insights into the relationship of eating behaviour and cognition. The final speaker of the first session was Dr Tiago Branco, who investigates instinctive behaviours. His research focuses on mice and their eating behaviour in threatening environments. Dr Branco explained how mice compute the decision to eat or escape in such environments. Session two (chaired by Professor Trevor Robbins) started with Dr Timothy O’Leary, who looked at an important challenge of our central nervous system: the need to maintain stable conditions and the ability to adapt to environmental changes. Dr O’Leary’s computational models show that organisms cannot be both perfectly stable and flexible: the option of flexibility comes at the price of less tightly controlled mechanisms. This talk was followed by Dr Kyle Treiber, who studied both neuroscience and criminology. She wants to develop a model of how and why individuals make the decisions to commit a crime, focusing on both biological and environmental factors. The session was concluded by Dr Sam Chamberlain who spoke about behavioural addictions. Traditionally, addictions were thought to be related to substances, such as alcohol or drugs. However, Dr Chamberlain argued that certain behaviours, such as compulsive gambling or stealing, show addictive characteristics. Individuals often crave the behaviour and show withdrawal symptoms when they abstain, similar to substance dependence. The afternoon session (chaired by Professor Nicola Clayton) continued with a highly varied programme about predation, pain, and psychosis. Dr Paloma Gonzalez-Bellido began the session by discussing hunting tactics of insects. She engaged the audience with flies’ optimal attack-trajectory, combing speed and acuity, using videos. Dr Ewan St John Smith continued to engage the audience with adorable videos of naked mole-rats. In contrast to other animals, naked mole-rats do not perceive acid as painful. Dr Smith is particularly interested in this acid-insensitivity of the naked mole-rat as a vehicle for understanding arthritic pain. Professor Paul Fletcher concluded the session with a presentation on psychosis. He argued that we can consider even our normal perception as a “controlled hallucination”: our brain tries to compute a model of the world with limited sensory information and ambiguity. This could serve as model for exploring psychosis, with false perceptions and irrational beliefs as inferential processing errors. Professor Sarah Tabrizi, director of the Huntington’s Disease Centre at University College London, gave the Plenary Lecture (introduced by Professor Jenny Morton). She discussed the great strides her team has been making in meeting the therapeutic challenge for Huntington’s disease. Huntington’s is a genetic disorder so Professor Tabrizi is focussing on a gene target. Indeed, her team has started work on the first ‘gene silencing’ trial in Huntington’s disease, a technique in which the expression of a gene is prevented. Afterwards, Professor Angela Roberts gave the closing remarks and the winners of the poster prizes were announced (judges led by Professor Ole Paulsen). The awards (£200 each sponsored by Cambridge Neuroscience) went to Matilde Vaghi for her poster on brain connectivity in OCD and to Dr Naotaka Horiguchi for his poster on the neural basis of contingency learning. The conference was then opened to the public for a talk from Professor Giovanna Mallucci, University of Cambridge, about new directions in dementia treatment (introduced by Professor James Fawcett). Professor Mallucci’s new approach is to stave off neuronal loss, and associated worsening of dementia symptoms, by reducing the rate at which synapses are lost. Professor Mallucci’s approach considers that when mice cool and hibernate, their synapses are dismantled and reformed. Synapse recovery could be a valuable new direction for fighting dementia by trying to delay the symptoms. The day ended with a drinks reception and exquisite conference dinner at Downing College. 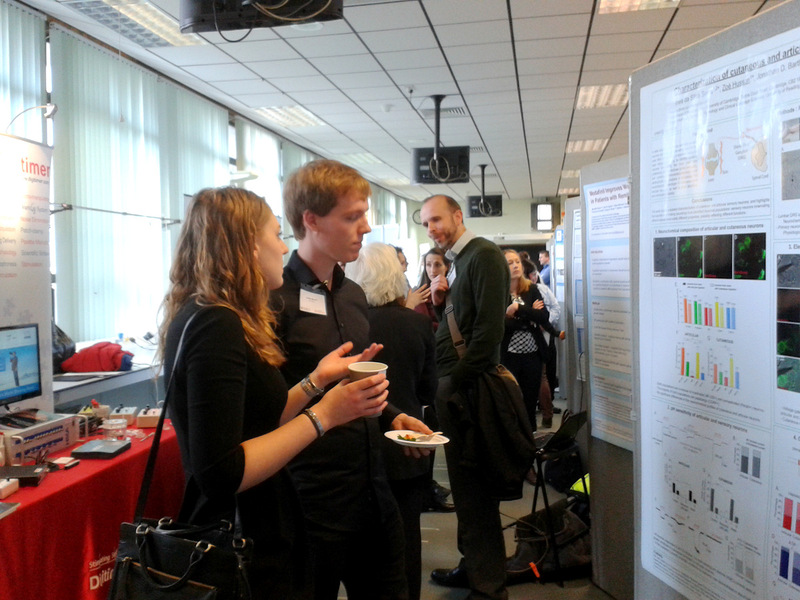 A worthy end to a popular meeting bringing together neuroscientists from Cambridge and beyond. Cambridge Neuroscience is grateful to all of its sponsors, in particular MedImmune, volunteers, poster judges, chairs and staff at the Physiological Laboratory for making CNS2016 such a success.